Are you a big fan of wordplay games like Scrabble, word crumble or word twist? Well, show off your wordplay skills by trying out Wordscapes with Friends on PC. This fun game from Severex explores the magic of language in a fun yet educating way. It offers players the chance to solve a wide range of crossword puzzles. You can also download it for your Android or iOS device to enjoy your favorite pastime on the go. Whichever device you choose to play on, the wordplay challenges in this game will put your brain to the test. Best of all, players can improve on spelling, expand vocabulary, and discover commonly confused words. The puzzles in Wordscapes with Friends on PC are suitable for teens or even adults. In the initial levels, you will start with simple three-letter words that even kids can solve. Longer, more challenging words come up as the levels advance. The game offers a limited number of letters in a circle. Playing is very easy since you just need to swipe or drag the provided letters when spelling a word. 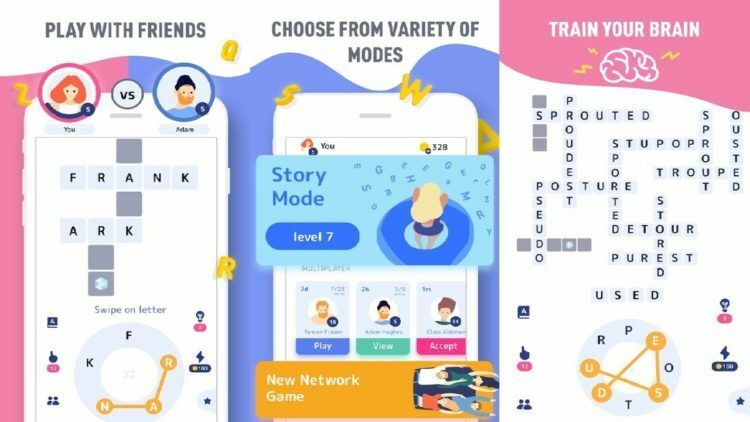 There is even a quick tutorial explaining the basic gameplay mechanics when you load Wordscapes with Friends for the first time. As the title suggests, Wordscapes with Friends is a multi-player game. An Internet connection is required to compete against other players. You can share a link to invite your friends for a game or challenge random opponents from all over the world. In these one-on-one duels, players take turns as everyone strives to spell the most words on puzzle. Alternatively, the arcade mode puts less pressure on the player with solo crossword puzzles. There is no guess limit when playing alone. So, you can scramble with the letters as many times as you want until you get a formation that sparks some spelling idea. Any losing player can request for a rematch when competing in PvP mode. Whether or not you will get the rematch is entirely up to your opponent. But, it’s certainly worth a shot if you feel like you can beat your opponent in the second round. When stuck, you can buy a hint. This will add a word on the puzzle. Simply click/tap on the hint icons below the crossword grid to request for clues. Keep in mind though this will cost you between 100 and 300 coins. Therefore, it is best to save your coins early on and only buy hints in the tougher levels ahead. The crossword puzzles give you a finite number of letters to work with, which can be tricky. When you can’t seem to come up with a new word, try different forms of the words you have already solved. For example, keep an eye out for homophones, words that sound alike but have different meanings and spelling. Alternatively, try changing the tense or spell one of the existing words in plural form. Wordscapes with Friends is more than just a fun-pastime. The game can help you learn new words. If you spell a new word and want to know what it means, tap the star icon on the bottom right corner. This will load up the dictionary with explanations of all the solved words on your crossword puzzle.